1. Preheat grill or broiler. Place shrimp on skewers. Combine chili powder and salt; sprinkle both sides of shrimp with the chili powder mixture. Marinate shrimp in a shallow baking dish in the refrigerator for 15 minutes. In a separate bowl, mash avocados and add seasonings, set aside in refrigerator. Place shrimp kabobs in a grill coated with cooking spray; cook 2 minutes on each side. Top each tostada with guacamole and 5 shrimp. Sprinkle with green onions. 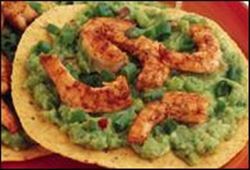 Enjoy this delicious guacamole shrimp tostadas Mexican recipe!